In order to deal with their dire financial situations, many newspapers have had to consider adjusting the way they do business in order to keep float. For some papers, this has meant cutting the number of pages, dropping wire content, firing staff, charging for web content or stopping home deliveries. While most of those measures are aimed at cost-cutting, there are only a few ways papers have found to increase revenue: most notably, they have started to put advertisements on the formally sacrosanct front page. It's not a new concept, smaller and struggling papers have had this practice for decades. 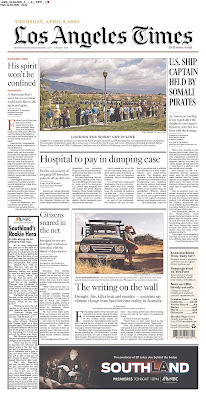 But at larger, more respected newspapers, A1 was always for editorial content only. 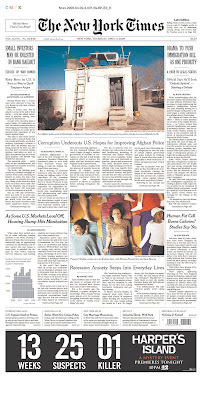 Last year, The New York Times took the leap, and put ads on their front page (and made buckets of money doing it). While there is not an ad on the front every day, I wouldn't classify them as "rare" either. This ad is pretty typical of what has been appearing in the Times, a banner across the bottom , underneath the editorial content. The color, the layout and the text are all significantly different from the way the news looks, meaning no one can confuse the ad as something else. On today's LA times, the situation was a little different. That boxed in article on the left side? That's an ad, made to look like, at first glance, like a news article. Now, LAT probably insisted on a couple things in the ad to make it look separate from the news - the sans serif text and hed, the boxed-in article, the big NBC logo above the story). NBC probably payed out the wazoo for it too. To me, the LAT ad pushes the limits on what front page ads should be. This one cuts into too much editorial space, risks confusing readers and is ugly. I understand the Tribune company is desperate, but I'm really surprised they chose to allow that much advertising on the front page. I guess it's good that they didn't allow the ad to go above the fold. Also, notice how the designer made sure the article it is not flush with top of the "Citizens snared" article, in order to make sure the reader had to look more closely at the story and differentiate news from ads. 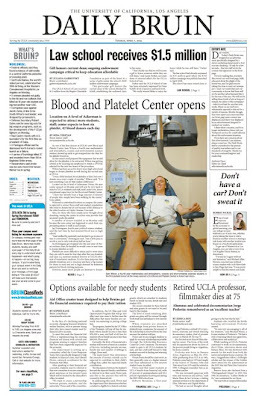 And while what the LAT did was distasteful, what UCLA's student paper did this week is practically criminal. 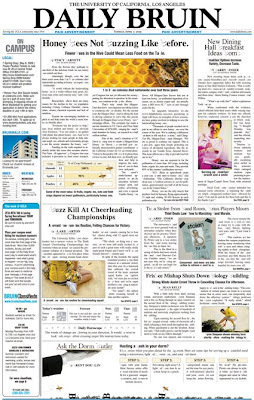 On Tuesday, the Bruin had a wrap-around ad that covered their front page. And here's what real front was wrapped in and what people saw when they picked up the paper. Apparently, there was much objection from the editorial staff over the fake front, and even offers by the staff to pay for the cost of the ad to stop it from running, but not enough to stop it from going to print. The Daily Bruin senior staff has begrudgingly agreed to run an advertisement as the front page of today’s paper. We see it as a regrettable but relatively unavoidable consequence of the recent financial trends devastating our sources of revenue and our industry....We were forced to make a decision we find distasteful at best – and dishonest and unethical at worst – because of the ever-present and unrelenting reality of the economy and the downturn of the journalism industry. The editorial goes on to say that, because of the amount of money the ad was bringing in, the paper had no choice but to print it in order to "save the paper". And without knowing to full extent the way the Daily Bruin operates and what their financial situation is, I can't outrightly criticize them. I will say, however, that at TNH, an ad like that would never had made it to a production, no matter how much money it brought in. Of course, TNH has the benefit of funding from the university, while the Bruin is independent and apparently running short on cash. Still, I'm amazed the Bruin doesn't have some kind of guidelines for this sort of situation, in order to prevent advertisers from this kind of trickery, or an adviser or manager that has the sense to stand up to it. There are certainly other kinds of ways the company could have set up their ad (and I'd argue, there are ways to do it more attractively as well). In March, TNH's advertising department was given the go-ahead to discuss front- and back-page advertisements with clients. So far, we have not had a buyer, but it is unlikely that our front will remain immaculate forever. I hope and believe we will never let our ads get this far, and our ad reps have been told as much. I hope the Bruin's blunder serves as a lesson for everyone as to what could happen if we allow our fear of losing money to override our journalistic integrity.